ProxyRack is an Australian based company, established in 2012. ProxyRack is a rotating proxy provider offering residential rotating proxies, USA datacenter rotating proxies, and mixed datacenter rotating proxies. They process more than 50 million page requests every day! They’re also known for powering some of the biggest data mining companies around the world. The primary service that they offer is the residential rotating proxies, which are also named the Residential Backconnnect Proxies. In terms of customer service, they offer a few phone numbers that you can call in order to get in touch with them. It doesn’t seem like there is any other way to get ahold of a customer service representative, which to me does seem to be a bit of an issue. Having a email or ticket based system would be more reliable. The Residential Backconnnect Proxies can work with any kind of proxy software that are supported by SOCKS or HTTPS. The system automatically accepts all protocols including HTTP, HTTPS, SOCKS4 and SOCKS5. These packages are best for data mining and casually browsing the web. The speeds are about average for your standard proxy service, so it should do fine for tasks and procedures that aren’t overly complex. By purchasing access to their system you will gain instant access to 108,000+ unique private residential IP addresses. Like other backconnnect proxy service providers, ProxyRack has a continuously growing IP base and extensive repository of over 108,000+ IP addresses. Their network of proxies might just be the most extensive on the market, and they are still adding to it! The benefit of this is that your internet usage will be almost impossible to track, and the likelihood of you getting on a banned or misused server are very slim. They accept payments in both PayPal and Bitcoin, which are generally the most popular ways to pay for proxy services. So you shouldn’t have any issue with payment. All of their IP addresses are routed through a cloud server, which allows you to access IPs from over 40+ different countries, including the United States, United Kingdom, Australia, Russia, the Middle East and so on. 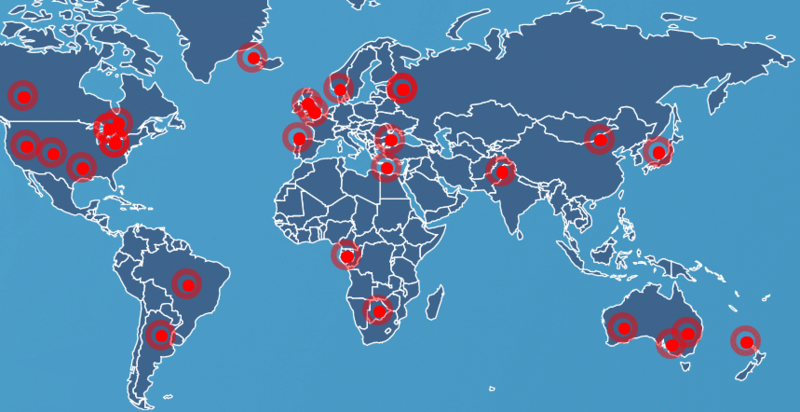 Keep in mind that with the package, you only have limited control over where your geographic IP address is. These plans are better suited for users who don’t care as much about where their proxy servers are located. If you need your IPs to ping from a specific location, then consider purchasing one of their other packages. 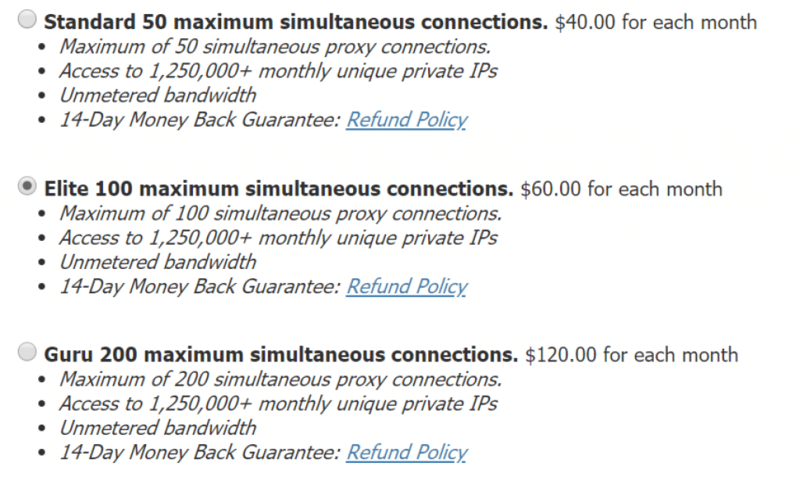 ProxyRack offers two ways to rotate their IP addresses in their IP pools. IP Rotating by Request. Their cloud server of proxy gateways allows you to connect through a single port and each connection you make automatically uses a new fresh IP address. Using this method, you never have to worry about switching your IP address, as it is taken care of automatically, and on your end the IP address never changes. This makes it very simple to use with various softwares and sites. IP Rotating every 10 minutes. Their cloud server of proxy gateways allows you to connect through their port and every 10 minutes the IP:Port connects to another proxy node to change to a new IP address. But I can not find where to orders this package! This system is very unique compared to other competing proxy services. Most proxy providers offer a package with a fixed amount of proxy servers that are changed/rotated at the end of the month, so that you’re not using the same IP address for too long. With ProxyRack, you’re instead only ever seeing one IP address on your end, which makes managing your software and programs much easier, while also being given access to over 100,000 thousand proxy addresses at a time. So not only is it a simpler process on the user’s end, it’s much more secure and private. Generally speaking their proxies will work with any kind of software that supports HTTP(s) or Socks proxies. Below is a list of software that we have either personally tested their proxies with or have had users report that the software is working perfectly fine with ProxyRack’s proxies. ProxyRack offers datacenter rotating proxies as well. These proxies are better suited for more serious use cases than the residential rotating proxies. They offer faster speeds, better reliability, and higher compatibility. While they can be used for more casual uses, like simply browsing the web, they’re intended for more intensive use, like data mining. Because of this, they are a little more expensive than their residential counterparts, but this is to be expected. The mixed datacenter proxy packages uses the same datacenter proxies as the dedicated backconnect proxies offered by Storm Proxies and the rotating private proxies offered by BlazingSeollc. The USA package only includes IP addresses located in the US, while the mixed option offers addresses from around the world. So depending on your needs, one will be better than the other. The datacenter proxies are much faster than residential rotating proxies. The speed varies a lot when using the residential proxies, and they are not considered fast when compared to datacenter proxies. This is because they mostly come from residential IPs and are shared amongst all their users. And anytime you’re sharing an IP address with other users, your speed will be slower. Some of the datacenter proxies may also be blocked by big name websites, such as Google. To learn why, I suggest that you read this post: Datacenter proxies vs Backconnect residential proxies. They allow up to four different IP addresses to be whitelisted which can be set on your proxy-profile page. If you change your password or add a new IP address for authentication it can take up to 15 minutes to reflect on our servers, so keep that in mind. We can say that ProxyRack is compatible with various devices and software. Their systems are very simple and easy to use for all potential and current customers. The set up process is very easy. The design is simple so that even new users can utilize them. In short, ProxyRack is very easy to use. Their service offers a 14-Day Money Back Guarantee, which is an excellent backing; most other services offer a 7 day money back guarantee at the most. 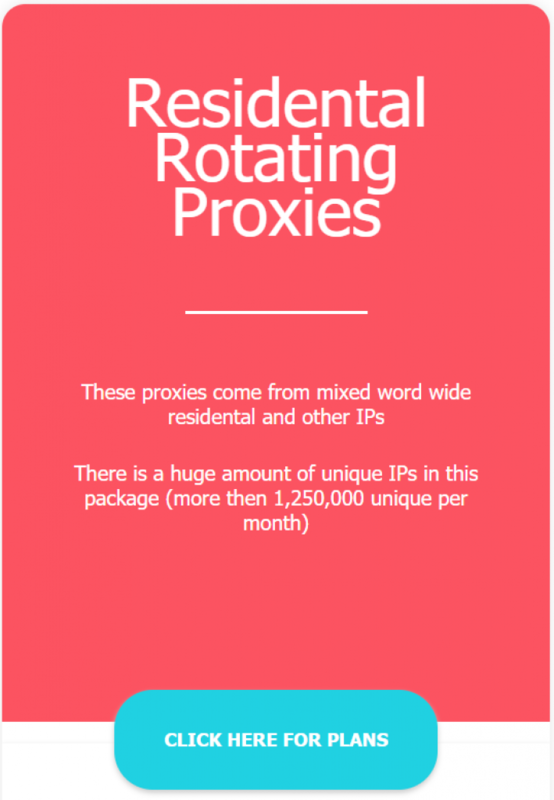 The ProxyRack team mainly focuses on residential rotating proxies, and now also offers residential VPNs. So, if you need residential rotating proxies for your SEO tools or other data projects, ProxyRack is just the choice for you! If you are already one of their customers, please share your reviews with us in the comments below. Cheers!